Environmentally unfriendly, volatile and a total sod to work with... But enough about Jeremy Clarkson - what's all the fuss about nitrocellulose? And why do guitar players still want to have their instruments covered in it? Clarence 'Leo' Fender, would be bemused by today's guitar market. Legend has it that he was always looking forwards; that the next guitar and the processes used to make it would always improve on the last. Quite what he'd make of Fender's desire to introduce nitrocellulose lacquer to its most modern facility in Ensenada, Mexico, is open to debate. As a pragmatist and problem solver, his first question would almost certainly be, "Why?" "The guitar would continue to 'cure' over the ensuing years, as the solvent in the finish continued to evaporate and harden"
After all, nitro is more problematic and time consuming to apply than polyester or polyurethane and it's less durable to boot, meaning that the guitar is far more likely to pick up cosmetic damage during its journey through the supply chain and, of course, on its much longer adventure with its eventual owner. Who would want that? Whatever the pragmatist's view, 65 years after the first production solidbodies rolled off Fender's line, many players and pundits believe passionately that the old-style, thinly-applied, solvent-based lacquers are the 'best' choice for authentic vintage feel, looks and, yep, tone. Detractors argue that it's pure nostalgia-driven hogwash. Either way, the facts are that Fender used both nitrocellulose and acrylic lacquers for 1950s and 60s standard and custom colour finishes. Originally developed for cars of the period, you can identify which is which by the associated Dupont paint codes (widely available online) that are prefixed with either 'Lucite' (acrylic) or 'Duco' (nitrocellulose). 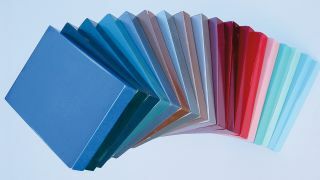 Lake Placid Blue (Lucite 2876-L), for example, is acrylic, while Sonic Blue would have been nitrocellulose (Duco 2295). Clear top coats were always nitro, but not all custom colours had clear coats; if you see a white Strat with a yellow-ish hue, for example, it probably has a clear nitrocellulose top coat. If it still looks very 'white', chances are there's no top coat. The same effect happens on Lake Placid Blue guitars that can appear more green with age. In fact acrylic paints were developed because they were more colourfast and didn't crack and check as easily as the older nitrocellulose paints. Nitro, however, made a nicer gloss by all accounts so what to use where was an ongoing process of trial, error and learning. The nitrocellulose and acrylic components themselves act as binding agents in the paint that then need to be mixed in solvent in order to be sprayed properly onto a guitar, or indeed a car. It's this solvent - acetone - that denotes the 'lacquer' part of the name, creating a highly flammable, extremely environmentally unfriendly cocktail in the process. Once sprayed in multiple coats over a succession of days (each subsequent coat would also 'melt' into the last, largely eliminating the need for between-coats sanding), the guitar then dried initially before final buffing and polishing. As we now know, that guitar would continue to 'cure' over the ensuing years, as the solvent in the finish continued to evaporate and harden. On some guitars, it never really did and the finish is still soft, but if you look at many a 50s or early 60s Fender today, the finish is often extremely thin and almost as one with the wood. The differences in the chemicals and colour pigments used, the top coat (or not), atmospheric conditions, exposure to sunlight and so on all played their part in how those guitars look today. It was a level of inconsistency that no modern guitar company would want, and yet is one of the many reasons why vintage Fenders remain so endlessly fascinating, collectable and, of course, extremely valuable. These days the use of high-VOC paints (volatile organic compound) such as nitrocellulose lacquers is strictly regulated, though those regulations differ significantly depending on where you are in the world, not least in which US State. "No, modern nitro finishes aren't exactly as they used to be, but we'll take them over glass-like polyester any day"
As a result - and also due to their ease of use compared with old-style solvent-based lacquers - more robust, easier-to-apply, quicker to cure, low-VOC finishes (notably polyurethane and polyester) were developed and are now the modern norm for most brands, including Fender. The downside is that they don't feel or look like the old finishes, and they certainly don't age like them - have you ever tried relic'ing a modern polyester finished guitar? It's like scratching glass in some cases. Many people would see that as a great advantage - the late Leo Fender included - because your guitar remains shiny and new- looking for much longer. For some others, however, it's just a straight no-no: it's lacquer or nothing. Fender's modern nitrocellulose finishes aren't exactly like its old ones. Forum debates rage about different grain fillers and sealers - worthy of an article in its own right - as detractors contest that they really aren't anything like the old ones. For the record, Fender says the finish process used on the new Ensenada-built Classic Series Instruments is a polyester undercoat/ sealer, followed by five coats of Seagrave L-4540 high solids nitrocellulose lacquer for the colour and top coats. So, why nitrocellulose at all? It's absolutely not for everyone but as far as this writer is concerned, ultimately it looks great, it can help a guitar sound great, it ages how vintage fans want it to age and, of course, it evokes the spirit of those world-changing instruments to which many of us aspire. No, modern nitro finishes aren't exactly as they used to be, but we'll take them over glass-like polyester any day of the week. We all know that the way your guitar makes you feel has a direct effect on how you play. There's no logic to it and it may well be entirely psychosomatic, so with that in mind, we'd ask what you'd rather pay for: counselling, or the finish you really want?